In honor of the upcoming celebration of the signing the Declaration of Independence, I thought it would be appropriate to honor some of the Founding Fathers by considering the significance of their signature on this historic document. By the time the Declaration was signed, the Revolutionary War had already started. The Boston Tea Party and Battles of Lexington and Concord had already occurred. It’s estimated that 200 copies of the Declaration were printed for publication and public reading. The message of the Declaration resonated with the colonists and inspired many to join the Revolution against the English crown. Who were the 56 men who signed the Declaration? Twenty-four were lawyers, jurists or studied law; eleven were merchants; ten were farmers and large plantation owners, four were physicians, four were politicians, two were clergy and one was a soldier. They were highly educated and successful, but when they affixed their signature on the Declaration they were putting it all in jeopardy. Those 56 men publicly rejected English Parliamentary rule over the colonies and renounced their allegiance to King George III. Although the colonies were technically already at war, signing the Declaration could have been considered an act of treason punishable by hanging. Along with others who supported the fight for independence, many of the signers suffered greatly from the war. Some had their homes ransacked or burned, witnessed the destruction of their business and lost loved ones in battle. 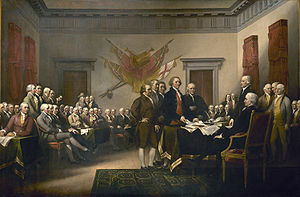 Their losses were not all directly attributable to their signing the Declaration; some were just the casualties of war. However, these men had a lot to lose from declaring their independence from England. Why would men who possessed influence, power and money, take such a risk? They were willing to sacrifice their lives, fortunes and sacred honor for a cause they believed in – Freedom! In some respects, I think that they were fighting for the freedom of other people more than for themselves. These were men of means and influence. Although they may not have liked all of the laws and taxes being imposed upon them by England, their lives were still very comfortable. By remaining loyal to the crown, most of them would have retained their influence and enjoyed a great life. However, they believed the cause was worth the potential sacrifice of everything they had. Fortunately, most of us will never have to make the choice that those 56 men faced. Their sacrifice and that of the thousands of other men and women throughout the ages who have fought and defended our freedom, means we don’t have to make that choice. For that… I am very thankful. We honor these heroes with an annual holiday, but I think there is more. Beyond the traditional barbecues, parades and fireworks, we can also honor these men and women by having a cause that we are willing to sacrifice for as well. We can’t personally thank or repay the Founding Fathers, yet we live every day with the benefits of their sacrifice. Are you willing to sacrifice for someone who has no viable means to thank or repay you? What’s the sacrifice? That’s up to you to determine, but I would start with your two most valuable things… your time and money. I think you’ll know a sacrifice when you feel it, but if it’s easy, convenient, and doesn’t change your life forever, it’s probably not a sacrifice. There many great causes and needs that tug at my heart, but there are a couple which top the list. Curious what they are? I have a passion for the thousands of children in America who are bouncing around our foster care system with no likelihood of a permanent family to call home; I want to see the scourge of human trafficking, most of which involves children, eradicated from this world (yes… the US is included); and I want to help build water wells in countries where clean drinking water is a luxury. That’s me. So what about you? Have fun celebrating the Fourth of July weekend. You may also give some time to honor the sacrifice of our Founding Fathers and to think about the cause to which you are willing to pledge your life, fortune and sacred honor.